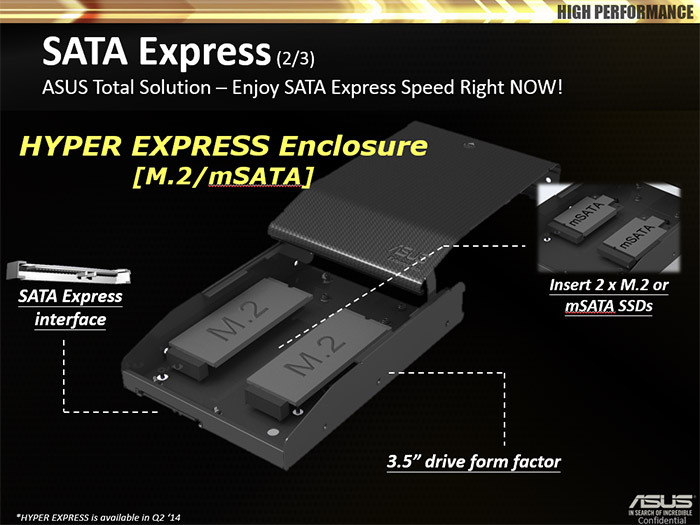 Earlier today we explained what SATA Express is and now we have the opportunity to show off the first 2.5-inch SATA Express drive that we have had the chance to take a look at personally. Our friends at ASUS gave Legit Reviews a chance to see and benchmark the ASUS Hyper Express SATA Express External Enclosure. 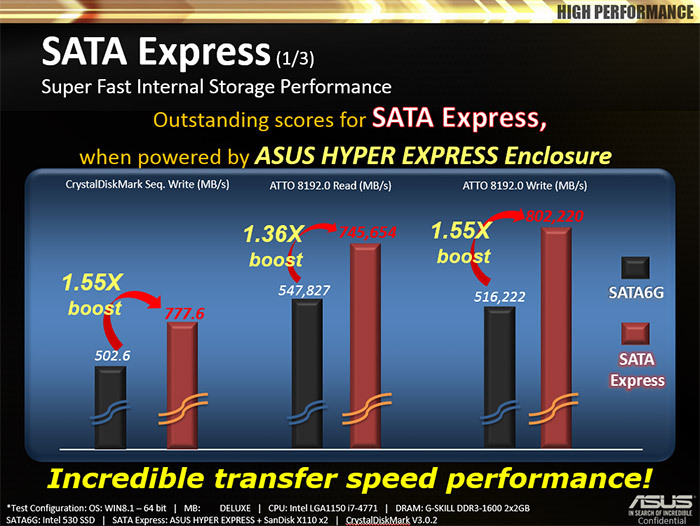 ASUS will be coming out with several versions of the ASUS Hyper Express. You have two 2.5″ SATA Express external enclosures that house either two mSATA or m.2 SSDs and a larger 3.5″ version that houses two SATA 2.5″ notebook hard drives or SSDs. 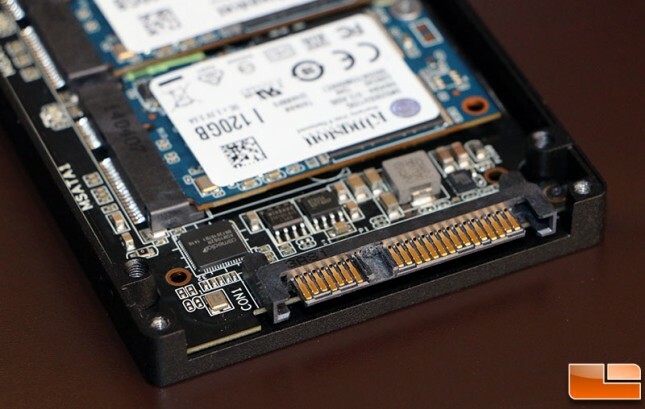 While the form factor differs, all are setup in a RAID 0 array with an internal RAID controller and then connected to the SATA Express interface that plugs directly into motherboards featuring SATA Express support. ASUS likely won’t be selling a complete drive (enclosure and SSDs) in the United States and instead just be offering the empty enclosure with the RAID controller setup and support CD. 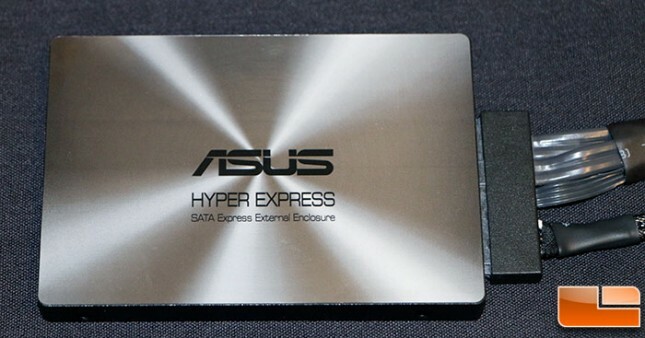 The ASUS Hyper Express that we were shown was a very early prototype, but the front of the drive will have the branding and product name on it. 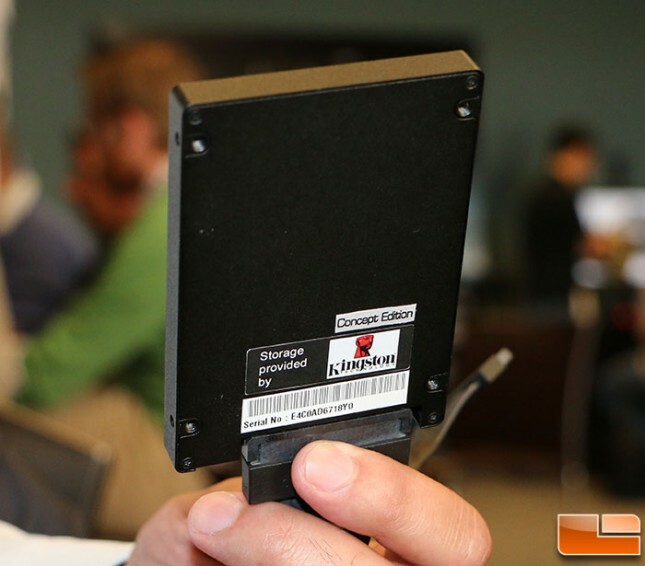 The back of the drive clearly has this labeled as a concept edition and you can see that the standard 2.5″ drive mounting holes are in place. This is basically a standard 2.5″ notebook drive with a 9.5mm z-height. Once the back cover was unscrewed you can quickly figure out what ASUS has done with the Hyper Express. This model has a black PCB with an ASMedia RAID controller on it and two mSATA drive slots for where you can place a pair of mSATA drives and screw them down. This demo unit was running a pair of Kingston 120GB SATA III 6.0Gb/s mSATA drives. The part number on these drives is SMS200S3-120G and they run about $95 each shipped. 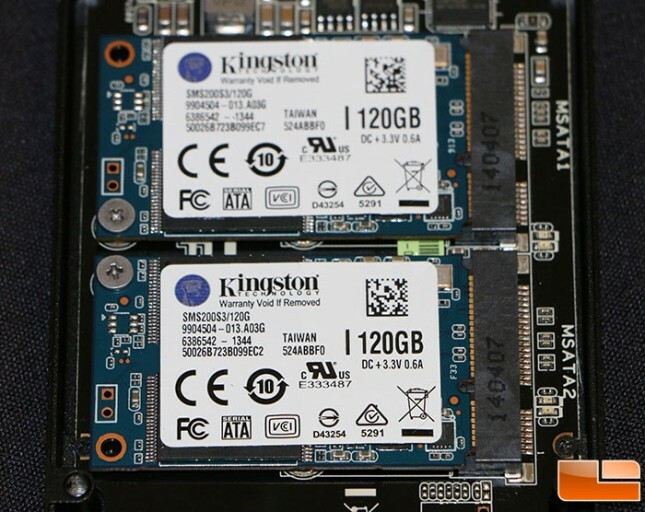 Kingston recently announced that they have come out with larger capacity mSATA drives, so you can go beyond 120GB now and get 240GB and 480GB models from Kingston. Kingston uses the LSI SandForce 2241 (30GB, 60GB, 120GB) and 2281 (240GB, 480GB) controller with the SATA Rev. 3.0 (6Gb/s) interface on these drives. 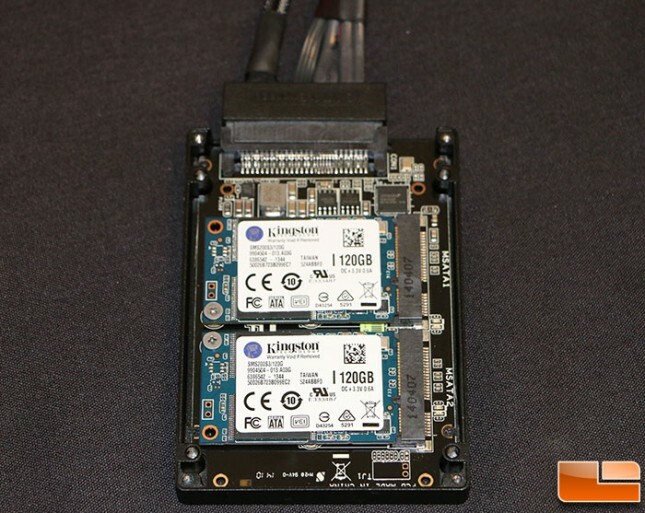 You can use any mSATA drive in the ASUS Hyper Express enclosure though, but it appears that ASUS worked mainly with Kingston Technology during the development phase of this SATA Express device. The ASUS Hyper Express uses the ASMedia ASM1062R controller, which is basically the ASM1062 SATA III 6Gbps controller that has RAID support. Here is a closer look at the bottom of the SATA Express connector on the ASUS Hyper Express. And here is a view of the top of the SATA Express connector. 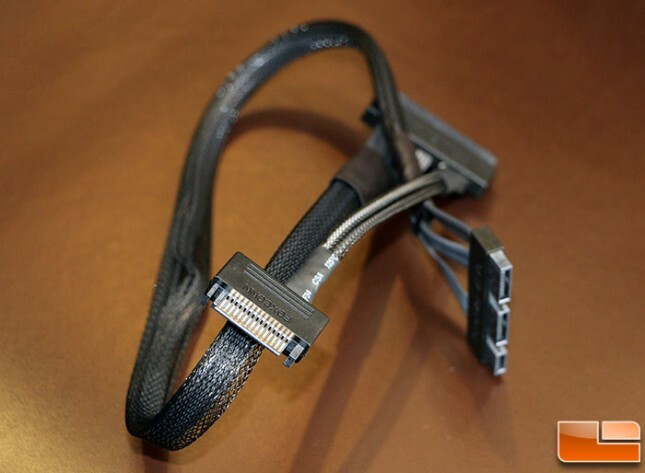 This is the SATA Express cable that will come with the ASUS Hyper Express SATAe drive. 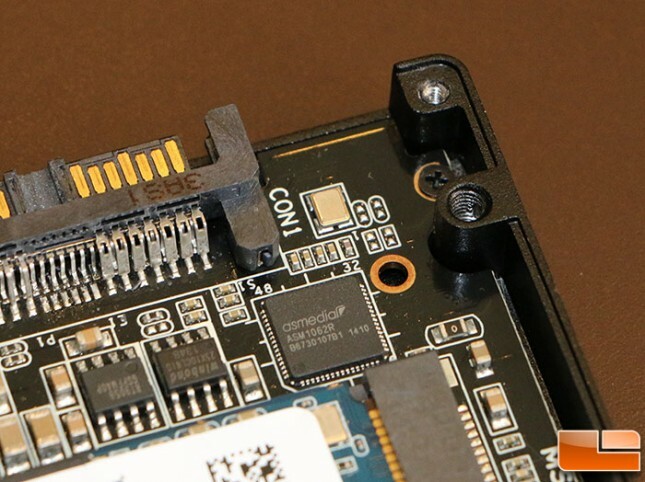 The top of the ASUS Hyper Express SATAe header has pins all across it, but the SATA Express connector that is used with the drive has just a small section of pins for the second PCIe data path. Here is a wiring diagram that was done by SATA-IO that shows the one side of the connector is for power and SATA/PCIe Lane 0 and then on the other side there are the pins for PCIe Lane 1. ASUS expects to see sequential read/write speeds of up to 745/809MB/s with the ASUS Hyper Express drive. The drive we got a chance to see in action was using early drivers with SanDisk X110 mSATA drives and was able to hit 704MB/s sequential read and 747MB/s sequential write speeds on CrystalDiskMark 3.0.3 64-bit. The 4K read/write speeds were at 32/81MB/s. 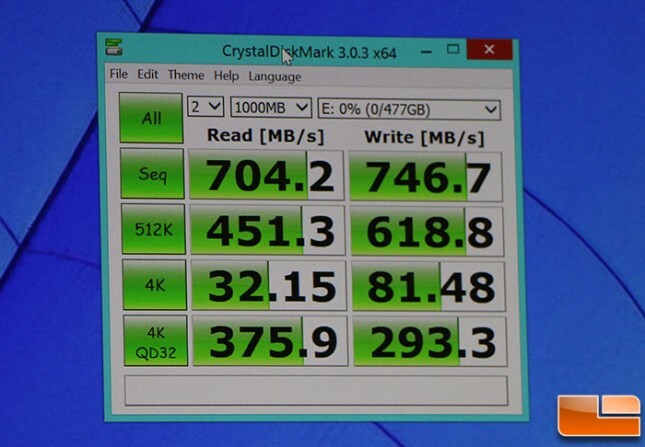 This benchmark was done on a pair of SanDisk X110 256GB mSATA drives with the model number of SD6SF1M-256G-1022l. The drives inside the ASUS Hyper Express will clearly play a role on performance, so keep that in mind if you plan on picking one of these up. It should also be mentioned that ASUS discovered and implemented a technology that they feel is critical for SATA Express to perform at its best — the Separate Reference Clock with Independent Spread Spectrum Clocking Architecture, or SRIS for short. 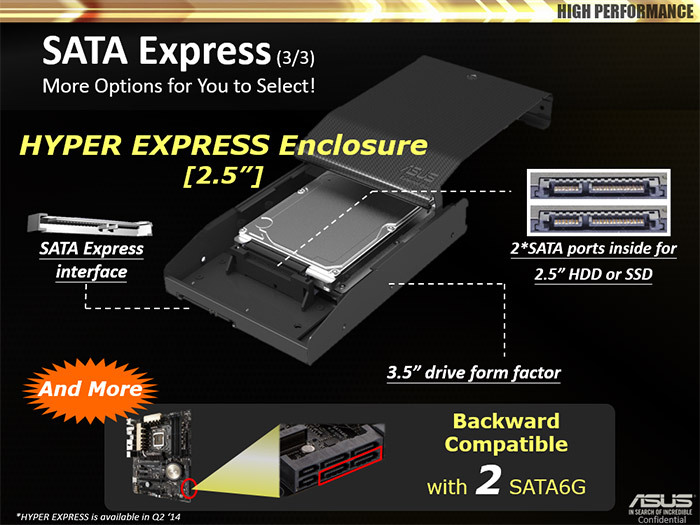 SATA Express-capable motherboards that lack the SRIS architecture in the UEFI/BIOS could present compatibility problems. SATA Express devices might not be recognized, for example; or recognized devices might not work correctly. 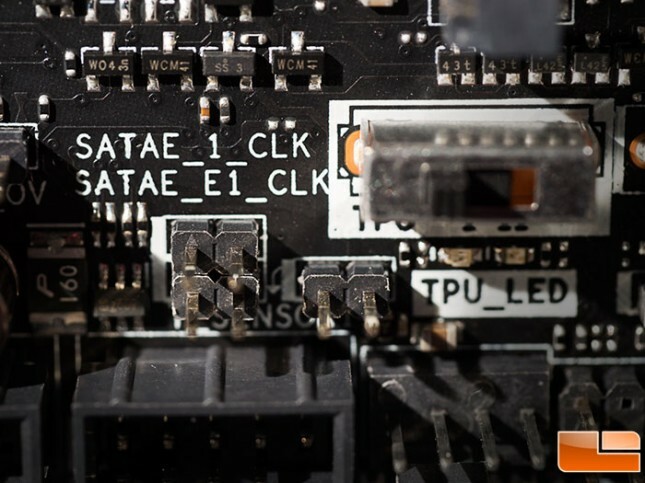 Even in situations where SATA Express devices are recognized and appear to function correctly, their true performance could be hindered by lack of SRIS BIOS implementation. The initial implementation of SATAe by ASUS on the Z87-Deluxe SATA Express motherboard was not based on the SRIS architecture. The original design had a pair of SATAe clock pins on the motherboard that sent clock signals to the slave device. That meant that the SATAe cable had to carry that signal. The side effect of sending a clock signal like this over a long distance or interconnect is that the data rate is impacted. This is due to high amounts of jitter and noise due to this design. It also means that a separate cable needs to be used and that adds to build costs. Last year there was a specification change and in the device itself there is now an oscillator in the drive itself just like the one that is already in the PCH. This means that the drive doesn’t need to be slaved to the clock generator in the PCH and no longer a need to have the two linked together. ASUS expects to have retail versions of the Hyper Express to be released in about two months, which makes sense as they need to release motherboards based on the Intel 9 series chipset first!